Before 1758, most biological catalogues had used polynomial names for the taxa included, including earlier editions of Systema Naturae. The first work to consistently apply binomial nomenclature across the animal kingdom was the 10th edition of Systema Naturae. The International Commission on Zoological Nomenclature therefore chose 1 January 1758 as the "starting point" for zoological nomenclature, and asserted that the 10th edition of Systema Naturae was to be treated as if published on that date. Names published before that date are unavailable, even if they would otherwise satisfy the rules. The only work which takes priority over the 10th edition is Carl Alexander Clerck's Svenska Spindlar or Aranei Suecici, which was published in 1757, but is also to be treated as if published on January 1, 1758. 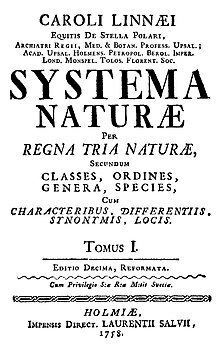 During Linnaeus' lifetime, Systema Naturae was under continuous revision. Progress was incorporated into new and ever-expanding editions; for example, in his 1st edition (1735), whales and manatees were originally classified as species of fish (as was thought to be the case then), but in the 10th edition they were moved into the mammal class. By current standards Pisces and Vermes are informal groupings, Insecta also contained arachnids and crustaceans, and one order of Amphibia comprised sharks, lampreys, and sturgeons. The Barbary macaque was included in the 10th edition as Simia sylvanus. 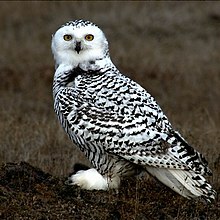 The snowy owl was included in the 10th edition as Strix scandiaca. Linnaeus described birds as: A beautiful and cheerful portion of created nature consisting of animals having a body covered with feathers and down; protracted and naked jaws (the beak), two wings formed for flight, and two feet. They are areal, vocal, swift and light, and destitute of external ears, lips, teeth, scrotum, womb, bladder, epiglottis, corpus callosum and its arch, and diaphragm. The common frog was included in the 10th edition as Rana temporaria. Crustaceans such as the water flea Monoculus pulex (now Daphnia pulex) were included in Linnaeus' Insecta. Linnaeus gave the name Cicada septendecim to an insect whose adult appears once in 17 years. The second volume, published in 1759, detailed the kingdom Plantae, in which Linnaeus included true plants, as well as fungi, algae and lichens. 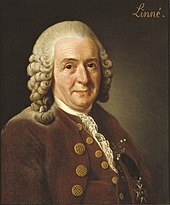 In addition to repeating the species he had previously listed in his Species Plantarum (1753), and those published in the intervening period, Linnaeus described several hundred new plant species. The species from Species Plantarum were numbered sequentially, while the new species were labelled with letters. Many were sent to Linnaeus by his correspondents overseas, including Johannes Burman and David de Gorter in South Africa, Patrick Browne, Philip Miller and John Ellis in America, Jean-François Séguier, Carlo Allioni and Casimir Christoph Schmidel in the Alps, Gorter and Johann Ernst Hebenstreit in the Orient, and François Boissier de Sauvages de Lacroix, Gerard and Barnadet Gabriel across Europe. ^ a b "Article 3". International Code of Zoological Nomenclature (4th ed.). 1999. ISBN 0-85301-006-4. ^ "Systema Naturae - an epoch-making book". Linné on line. Uppsala Universitet. 2008. Retrieved August 30, 2010. ^ a b c d e f g Carl von Linné, translated by William Turton (1806). Volume 1. A general system of nature: through the three grand kingdoms of animals, vegetables, and minerals, systematically divided into their several classes, orders, genera, species, and varieties. London: Lackington, Allen, and Co.
^ Kenneth Kitchell, Jr. & Harold A. Dundee (1994). "A trilogy on the herpetology of Linnaeus's Systema Naturae X" (PDF). Smithsonian Herpetological Information Service. 100: 1–61. ^ Carl von Linné, translated by William Turton (1806). Volume 2: Insects. A general system of nature: through the three grand kingdoms of animals, vegetables, and minerals, systematically divided into their several classes, orders, genera, species, and varieties. London: Lackington, Allen, and Co.
^ Mary P. Winsor (1976). "The development of Linnaean insect classification". Taxon. 25 (1): 57–67. JSTOR 1220406. ^ a b Carl von Linné, translated by William Turton (1806). Volume 4: Worms. A general system of nature: through the three grand kingdoms of animals, vegetables, and minerals, systematically divided into their several classes, orders, genera, species, and varieties. London: Lackington, Allen, and Co.
^ Bernard R. Baum (1968). "The problem of typifying certain names in Linnaeus's Systema Naturae ed. 10". Taxon. 17 (5): 507–513. JSTOR 1216048. ^ Carl Linnaeus (1759). "Volume 2. Regnum Vegetabile". Systema Naturae (10th ed.). Stockholm: Laurentius Salvius. The original 1758 Systema Naturae at Biodiversity Heritage Library (BHL).